Ohsumi was a series of five small satellites built to become the first Japanese satellite on orbit. 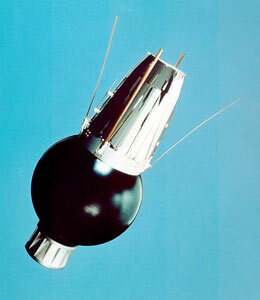 The satellite consisted of a small instrument package attached to the fourth stage of the L-4S launch vehicle. It was equipped with two hook-type antennas and four beryllium-copper whip-type antennas (circular polarization). For power supply, a silver oxide-zinc battery with capacity 5 Ah as power supply was carried. It had a mass of 24 kg, including the burned out fourth stage. The first attempt to launch an Ohsumi satellite failed on 26 September 1966 when the fourth stage attitude control failed. On 20 December 1966 the second attempt failed due to fourth stage failing to ignite. The third satellite, launched on 13 April 1967, also failed to reach orbit. Again the fourth stage failed to ignite. After three launch failures, a special L-4T suborbital vehicle was launched to iron out the launch vehicle problems. But then on 22 September 1969 the fourth launch attempt ended again in failure. This time, the fourth stage control system malfunction after third stage collided with fourth stage. The fifth Ohsumi was finally successfully launched on 11 February 1970. From 15:56:10 to 16:06:54, about two and a half hours after the launch, a radio signal from Ohsumi was received at Uchinoura to confirm its first revolution around the earth. The radio signal level gradually fell and the next day, February 12, during its 6th revolution, it became very faint. The signal could no longer be detected during the 7th revolution. It is believed that the signal of Ohsumi was lost 14 to 15 hours after launch, probably caused by rapid reduction of power capacity because of higher than expected temperatures. The satellite continued to orbit the earth, and at 05:45 on 2 August 2003 (JST) it reentered the atmosphere and burned up. The reentry location was over North Africa.